A $2,500 per computer hard-drive, and/or $1,000 per mobile device, retainer is due upon service contract/agreement. The retainer will be used to pay the final account balance on the final invoice. Appearing for testimony (deposition, court, or stand-by status) is charged at $2,500 per day or any part thereof. Travel – $125 per hour, with a maximum of 5 hours per day (plus expenses) for all travel (plus mileage/per diem) Mileage is charged at .60/mile and per diem is based on the current federal per diem rate for the area. Once the data is recovered, or imaged, SJDC will return the original media to the client and retain the forensic images until additional services are complete. Retention of the original computer/hard-drive/media is subject to a $250 per computer/hard-drive/media per calendar month (or any part thereof) charge. Once services are complete, SJDC will notify the client and charge $250 per drive/media per calendar month (or any part thereof) charge, starting 30 days after notification, for the storage of images. Drives/media will not be returned until all outstanding balances are settled and storage fee will apply until account balance is paid and drive/media is returned. Unpaid balances that are 90 calendar days overdue may result in the disposal of drives/images. In such case, any additional (repeat) service requests will be billed according to this schedule of fees. All time allocated is rounded to the quarter hour. Services are provided on a first-come/first-served basis unless a request for expedited services is received. Any request(s) for expedited services include an additional fee of 25%. SJDC invoices monthly, bi-weekly, and/or at various frequencies with the retainer applied to the final invoice. Accounts are considered past-due when invoices are not paid in full within 30 days of being issued. Clients with past-due accounts will be charged interest at 18% (annual) and storage fees as outlined above and services will discontinue until account is paid. All payments are subject to additional incurred fees (i.e. wire fees, returned check fees, etc). SJDC reserves the right to refuse or discontinue services to anyone for any reason. The Schedule of Fees is subject to change without notification. A service agreement is required to retain SJDC. Who do you trust your digital evidence to? 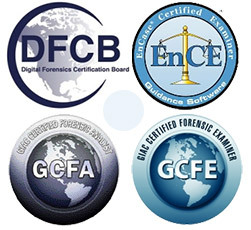 SJDC will replicate and/or review the findings of other digital forensic professionals (DFPs) to ensure that your clients’ interests are being protected. In non-litigious situations, SJDC will recover data that has been deleted, is hidden, or from re-formatted hard-drives at a discounted rate. In some cases, SJDC may be able to recover your data from a corrupted drive. SJDC will provide technical support to requestors/litigants regarding access to, and recoverability of, data. SJDC can assist with the identification and recovery of missing/deleted partitions and hidden volumes.